In a production run of 750, the BMW HP4 Race is individually crafted by a small, highly specialized team, ensuring the highest level of the racing bike’s quality. BMW Motorrad presents its HP4 Race as the first motorcycle in the world where the main frame is made entirely of carbon fiber weighing 7.8 kilograms and is produced industrially in small series, thereby making this future-oriented technology available for anyone to purchase. The front and rear wheel are also made of a high-tech material, enabling a weight reduction of approximately 30 percent as compared to light alloy forged wheels while retaining a deliberately rigid design. The new HP4 RACE likewise meets the highest demands of racing technology in the area of spring elements and brakes. Both the FGR 300 upside-down fork and the TTX 36 GP spring strut are supplied by the Swedish manufacturer Öhlins, with identical parts being used both in the Superbike World Championship and in MotoGP. The brake system of the new HP4 Race features two Brembo GP4 PR monoblock brake calipers. Coated titanium pistons and single-piece aluminum calipers with chemically nickel-plated surface make for what is currently the very best combination of materials available. In conjunction with 6.75 mm thick 320 mm T-type racing steel brakes, the system ensures stunning brake performance. The new HP4 RACE has a purebred racing engine similar to specifications 6.2 and 7.2 as in the Endurance and Superbike World Championships. The peak output is 158 kW (215 hp) at 13 900 rpm. The maximum torque of 120 Nm is reached at 10000 rpm. The maximum engine speed has been increased as compared to the engine of the S 1000 RR from 14 200 rpm to 14 500 rpm. 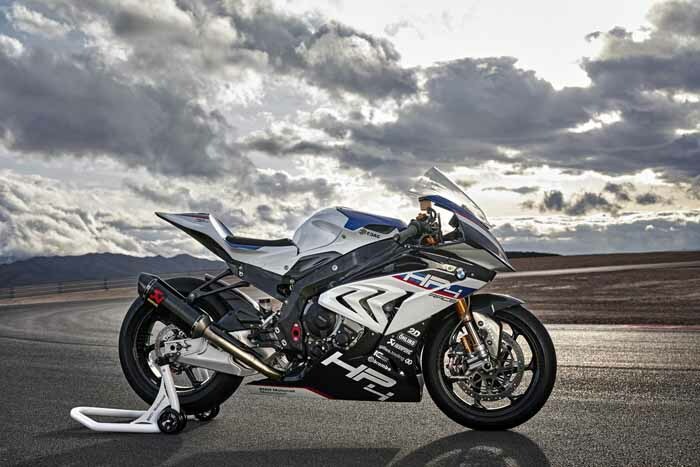 The new BMW HP4 RACE comes with an extensive package of electronic control and assistance systems as well as a weight-optimized on-board electrical system to meet racing needs. A wealth of information is available on the 2D dashboard with transferable data memory (2D logger). Wide-ranging set-up options for different track layouts and road surface conditions are provided by the audibly perceptible Dynamic Traction Control controlled by ignition cut, Engine Brake EBR and Wheelie Control. These can be programmed selectively for each gear according to rider preference, allowing optimum use of the enormous riding dynamics potential offered by the new HP4 RACE. The carbon fiber trim, the intake silencer cover and the seat hump in the new HP4 RACE feature the BMW HP Motorsport colors. A hand-brushed aluminum fuel tank sealed with a clear finish underscores the bike’s high-quality racing look.